India faces a surplus of foodgrains. Is exporting a good option? With India’s grain mountain set to implode, the government is desperate to push the exports of rice and wheat. 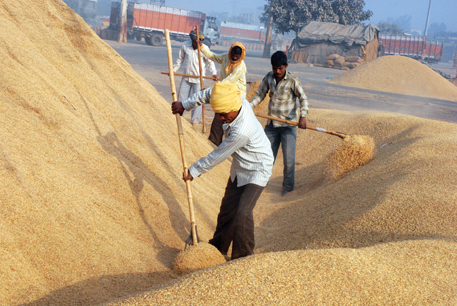 However, a global glut and the resulting depression of prices are dimming the prospects of foodgrain exports. According to the Food Corporation of India (FCI), the nodal agency for grain trade in the country, India is sitting on 34 million tonnes of rice and 36 million tonnes of wheat against the required buffer of 50.9 million tonnes of foodgrain to meet the needs of its public distribution system. The stockpile will spiral with another bumper rice harvest of 100 million tonnes as per official estimates. Overflowing granaries and stocks of rotting foodgrains in the open for want of storage space had prompted the government to allow the export of two million tonnes of wheat in August this year. But with the minimum price for exports fixed at $300 per tonne (for the current fiscal) against the prevailing global rates of $230 to $260 per tonne, no grain has left the country. This forced the government to reduce the export price of wheat by $40 per tonne. In November, FCI floated new tenders for wheat export with the minimum price at $260 per tonne. Talking to Down To Earth, an FCI official says, “Since 2011, when India resumed its wheat exports, the average price drawn was around $310 per tonne. So the government reached the consensus for $300 per tonne.” When India had fixed $300 as the export price for wheat in 2012-2013, the global prices were between $330 and $350 per tonne. 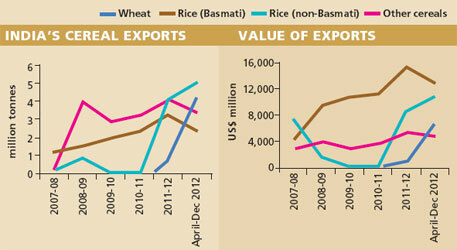 In 2012-2013, economists estimate, cereal exports were around 24 million tonnes. About 50 per cent of it was rice, 27 per cent wheat and the rest were coarse grains like corn, sorghum, barley, oats, rye and millets. But for economists C P Chandrasekhar and Jayati Ghosh, exporting is not a viable option for a country like India with significant food deficit. “India still has some of the worst nutrition indicators in the world, on par with or below many Sub-Saharan African countries. People in India are faced with food inflation as a result of which food commodities are becoming increasingly unaffordable, even for many of those above the income poverty line...” they say in their research paper titled, “The Political Economy of Indian Food Exports”. The United States Department of Agriculture (USDA), in its World Agricultural Supply and Demand Estimates, stated that the global supply of foodgrains in November was expected to be 2,878.53 million tonnes, of which wheat and rice account for 30.6 per cent and 20 per cent respectively, with the rest being coarse grains. The report, published on November 8, states that in 2013-2014, global wheat supplies are lowered by 0.8 million tonnes and consumption lowered by 3.0 million tonnes, with reductions in foreign feed (wheat) and food use. Global output of rice has risen by 1.7 per cent in 2013-2014 to an all-time high of 476.8 million tonnes and the consumption has been lowered by 1.5 million tonnes. The FCI official believes Indian cereals can fetch more because Indian grains are of good quality, but says we fail because of the handling process. “Our handling process is not fully mechanised due to which our grains are broken and we cannot bargain much.” This, he says, makes us uncompetitive in the international market. The main buyers for Indian wheat are South Korea, Ethiopia, Bangladesh, Yemen, Thailand and Indonesia, while rice buyers are Bangladesh, Australia, Bahrain and Ethiopia. India is one of the largest exporters of Basmati rice to the Gulf and Saudi Arabia. In October 2013, India’s domestic price for wheat was between $240 per tonne (Rs 14,710) and $270 per tonne (Rs 16,550), while the global prices were $230-$250 per tonne. The better deal seems to be the domestic market. Dharam Singh, a grain trader in Asia’s largest grain mandi at Khanna, Punjab, says, “The fast-growing food-processing industry in the country is a better bet than exports. We don’t know why the government is keen on exports when the food-processing industry is ready to give us better prices for foodgrains. They are ready to pay anything from $10 to $20 more than the global prices.” He suggests that the need is to explore options to earn more revenue within the country. “Let India export more processed food. It will give employment as well as revenue,” he adds. Santosh Kumar Singh, an economist with the US government, in a report for USDA on India, states that the domestic price of rice increased in September/October due to export and speculation on crop damage in the aftermath of cyclone Phailin and floods in eastern India. However, prices are expected to ease with the start of the harvest season. He says because of the cyclone around one million tonne of rice is estimated to have been destroyed in Odisha alone. This apart, the cyclone led to heavy and unseasonal rains in Punjab and Haryana. So there has been a downfall in rice production by about five per cent from last year’s 105 million tonnes. Singh adds that according to official reports from the Odisha government and the Indian Council of Agricultural Research, rice yields are expected to decline in eastern states of Bihar, West Bengal, Jharkhand and Assam.